For repair of axial and para-oesophageal hernia. For maximum patient safety all DynaMesh®-HIATUS implants come with DynaMesh® visible technology (see visible technology). The region of the hiatus oesophagus is extremely mobile due to respiration and swallowing. 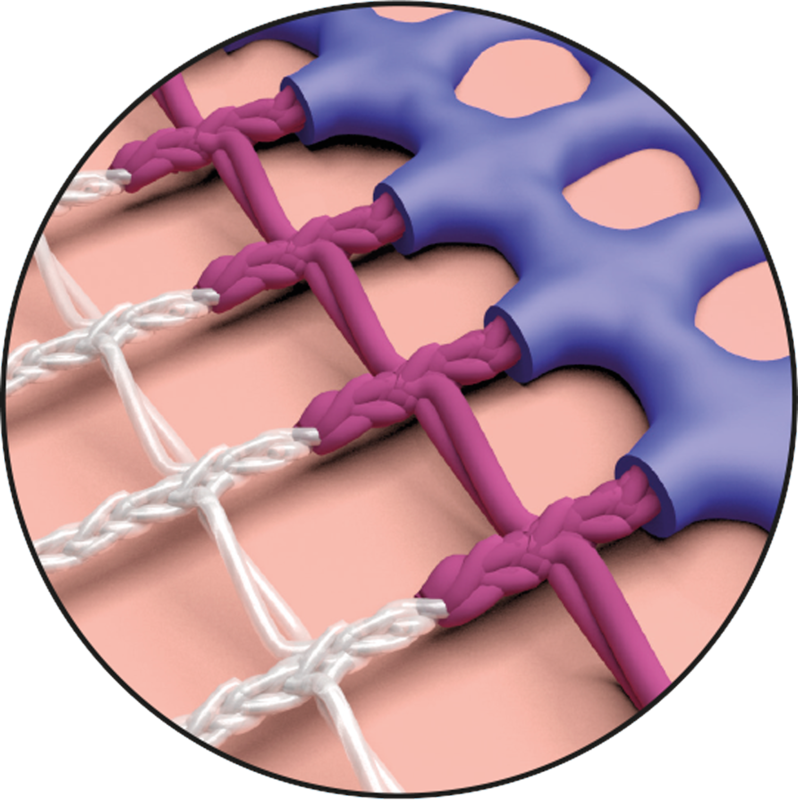 The placement of mesh implants in this region of high mobility demands mature technology for effective prevention of mesh erosion. 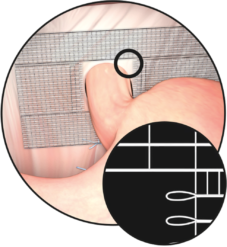 DynaMesh®-HIATUS has been specially designed for the repair of such extremely demanding hiatus hernias. The sophisticated construction of the implant combines three technologies and thus ensures the maximum degree of patient safety. The stable construction and the highly effective porosity are a substantial part of keeping the opening for the oesophagus (red marker) virtually constant even over the long term. 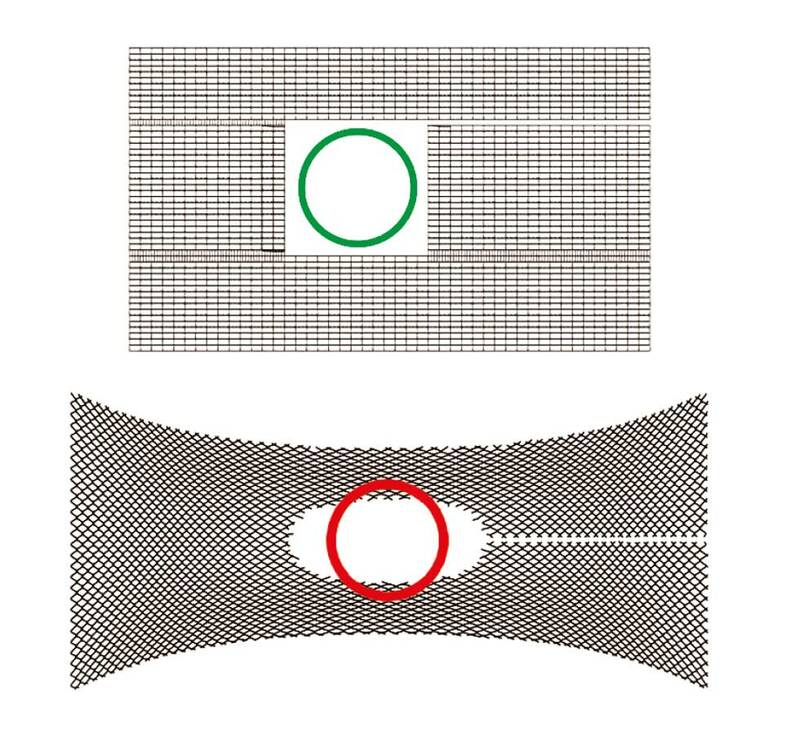 Conventional mesh structures are deformed under load. 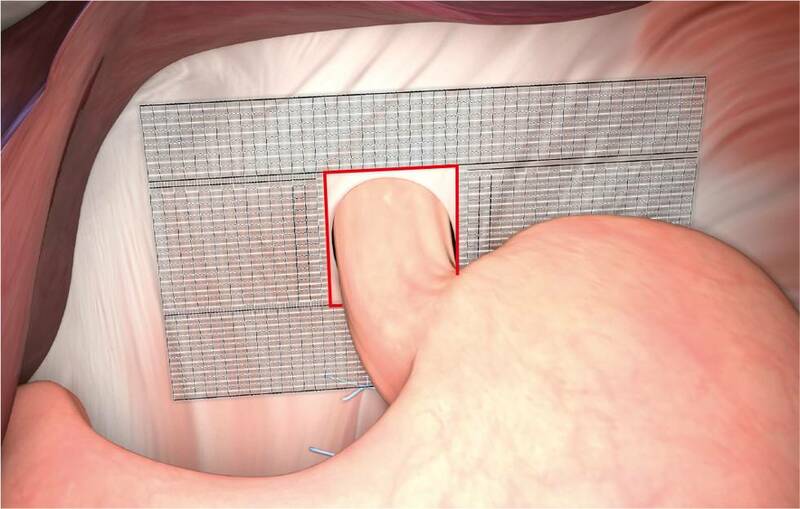 Constriction of the mesh in the region of the hiatus may reduce the distance between mesh implant and oesophagus, eventually causing mesh erosion. DynaMesh®-HIATUS is based on a sophisticated textile design with rectangular pores, which even under load retain a high degree of shape stability. Mesh implants tend to shrink after incorporation in vivo. 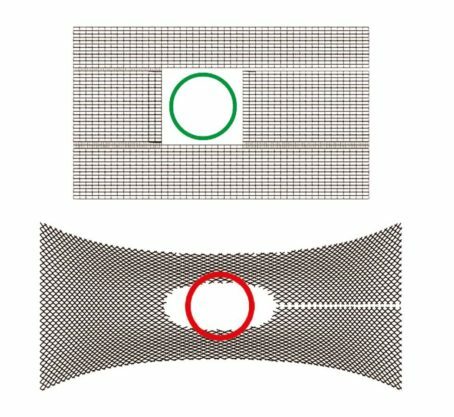 DynaMesh®-HIATUS has a high effective porosity, which ensures that the mesh implant is thoroughly incorporated. During incorporation the use of the proven and highly biocompatible PVDF polymer ensures that scarring is kept to a minimum. The good incorporation of the mesh implants combined with little scarring leads to minimisation of mesh shrinkage and permanently high flexibility of the incorporated implant. If the mesh does come into contact with the oesophagus in spite of all measures to prevent it, DynaMesh®-HIATUS has smooth mesh margins that minimise the danger of mesh erosion.